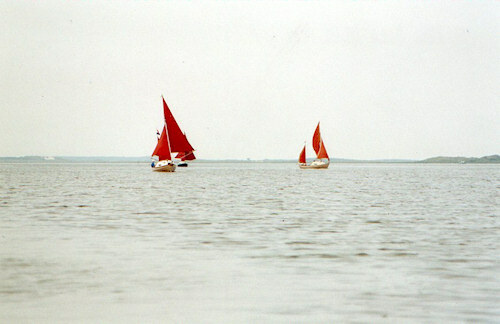 The NKDE (Nederlandse Kring van Drascombe Eigenaren) held their early summer cruise on the Waddenzee before and over the Ascension Day holiday, at the end of May 2001. With many owners wishing to take an early summer holiday it was arranged that those wishing to join a feeder cruise would assemble at Lauwersoog, in Friesland, on the north Dutch coast on Saturday 19th May. The plan was to cruise together for several days, returning to Lauwersoog on the Wednesday to meet up with others that were to take part in the traditional Hemelvaart Waddenzee Cruise. So it was that three Coasters, Yraida, Timshel, and Windroos, sailed east from the sea lock that Saturday evening to cross the Waddenzee and spend the night, high and dry on the Brakzand, in the lee of Schiermonnikoog (the most easterly of the main inhabited Dutch Wadden Islands). That same Saturday evening two more Drascombes arrived at Lauwersoog, a Cruiser, Midi, and another Coaster, Whisper of Sunart. They were just too late to catch the tide with the others. So a Waddenzee ‘chase’ began. But the wonders of the gsm/sms mobile telephone system drew an initial blank. The location/destination of the cruise Admiral, Michel Maartens on Yraida, remained a mystery. So the latecomers stayed and anchored at the Lauwersmeer for the night. Sunday morning dawned bright and clear, with a steady force 2-3 west wind. Once out of the sea lock Midi and Whisper of Sunart set off, north westwards towards Engelsmanplaat, hopeful of finding the others west of Schiermonnikoog. Presently a Drascombe was spotted, heading their way. But it was not Yraida, instead White Seal, now on the eighth day of a cruise from home, rushed down the wind to greet them. So three now hunted three! Coming to anchor at low water in the Smeriggat (translation: ‘the Filthy Hole’), more in hope than expectation, the mobile was again switched on. Wonder of wonders… an sms from Michel (sent just ten minutes after the mobile had been turned off at the sea lock), “Approaching Simonszand”. The pursuers had gone west, the fleet had gone east! Now some 15 n.m. separated the two groups. A quick course was plotted, in view of the settled conditions, passing north of Schiermonnikoog along the southern fringes of the North Sea. The chase was on! In glorious sunshine the anchors came aboard and the western group reached away NE, out onto the dying swell of the open North Sea. The reach became broader as the east-going flood tide swept the three chasers, rushing along the 3.5 meter depth sounding, ever eastwards towards Rottumerplaat, and the channel east of Simonszand. At times only the masts of the Drascombes were visible to each other above the swell, as with poled-out jibs, and sun drenched decks, the ground speed (observed on the gps) built up to 7, then 9 and finally almost 10 knots! Sweeping in from the sea after a three hour ‘charge’, between the fast flooding sand banks of the Lauwers, the three crews scanned the horizon with binoculars, hunting for the tell-tale silhouettes of the other Drascombes. On they swept, gybing southwards, as the wind picked up and cooler clouds built up in the western sky. But there was no sign of the others. Finally decision time was reached, the sails were dropped, anchors let go, and it was time to take stock. Again the horizon was scanned in the hazy overcast gloom. Suddenly shouts of relief. As the boats rose on the tide the crew of Midi had Drascombes in sight. On the far side of the swiftly flooding Simonszand the unmistakable masts of Drascombes stood out against the horizon. Just a rapidly shrinking nautical mile of sand separated the two groups as each in turn rose up, on the flood, from the vaargeulen (tidal channels between the sands) in which they lay. 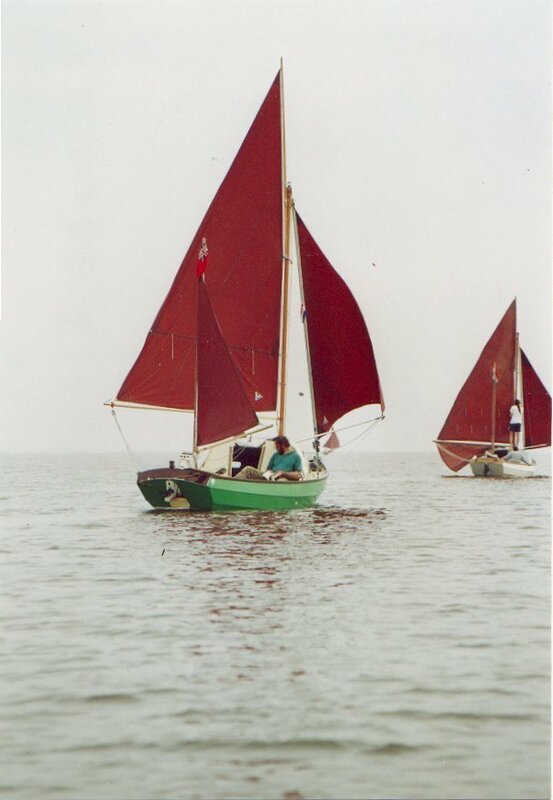 As the water returned the chasers joined the other boats, skimming swiftly, with barely six inches of water under the keel, over the sands just in time for a well deserved borreltje. (A famed occasion for Dutch Drascombe sailors… it needs no translation, does it?) So began the Wadden Cruise. Now five boats were together. (Windroos had already returned to Lauwersoog as work had beckoned till Wednesday.) Once fortified, the flotilla raised anchor once more, and with the last of the flood, helped by the dying evening NNE breeze, skimmed away west, over the Brakzand to anchor and fall dry in the lee of Schiermonnikoog’s Willemsduin for the night. Monday dawned clear and cool with a steady NE force 2. But the bright sun soon warmed the sleepers into action. 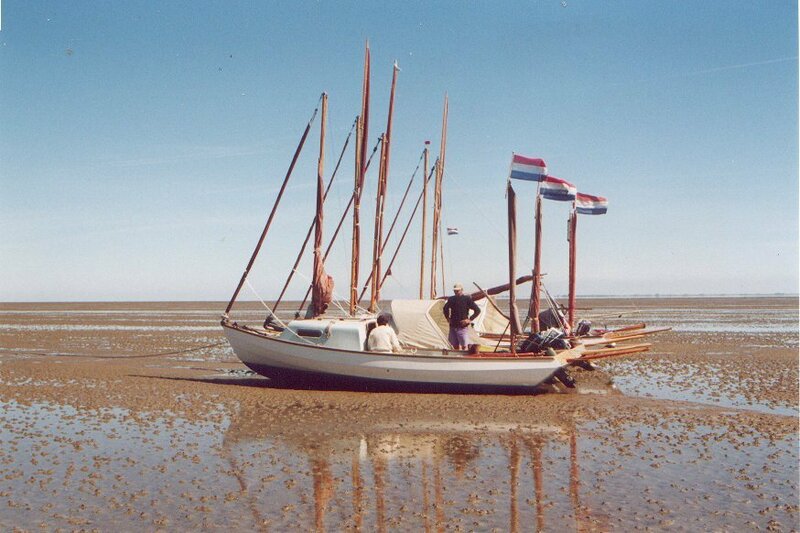 As the flood tide lifted the Drascombes clear of the mud flats, plans were made for the sail west to Ameland. With just enough water to float, anchors came aboard and steering with an oar over the transom (an art of necessity, perfected by experienced Wadden sailors), one by one the three Coasters and two Cruisers crept away down the wind, out over the Brakzand. Rounding the SW tip of Schiermonnikoog, yet another Drascombe could be seen approaching. It was Olle with Chris van den Broek, who had just flown in from Nairobi that Sunday morning, to join the group. Michel’s local knowledge led to a perfect landfall, through breaking surf, into a small tidal lagoon in the west sands off Schiermonnikoog, where, rafted together, the crews sunbathed and lazed the afternoon away. Still the group was made up of five boats. Now Timshel was absent, Han van Vlierden had decided to go to look up old friends on the island. The returning tide turned the place into a maelstrom of confused and breaking seas. One by one the Drascombes broke from the raft, tumbling and bashing, like surf boats, out again into the deeper water and safety. Now the wind was NNE force 3 and with the incoming tide the group hammered across the Westgat on a fast reach into the calmer channel south of Het Rif. Then on again through the Smeriggat, to linger, while the tide peaked fell and returned, west of the Engelsmanplaat. Good planning by the Admiral… for here a five star feast aboard Midi was prepared by maitre Eugène du Corstanje and demolished! Next morning the flotilla ghosted away, down the NE breeze, south of Ameland. Just outside the coastal marine conservation zone the fleet anchored, at the top of the tide, in the lee of Het Oerd – the highest of a magnificent set of sand dunes that backbone the east end of Ameland. All round on the edge of the conservation area the local bird life was busy picking through the shallows, in the brilliant sunlight, as the waters receded back over the mud flats. Hot, out of the by now fresh NE breeze, the Drascombe crews soon emerged to wander ashore to follow the trails through the dune landscape that is Ameland. Slowly, summer sunshine climbed higher over the small group of marooned boats. Some crews collected buckets of cockles, others dozed out of the sharp cool NNE breeze. Much later, when the water returned, anchors were raised and the little fleet coasted away back towards the NE, into the dusk, to fall dry once more after midnight, on the sands south of De Hon (the east tip of Ameland). Wednesday was the day selected for the feeder cruise to return to welcome other Drascombes at the slip way of the Yacht Marina Noordergat in Lauwersoog. But the sail was to prove a testing one, against the wind and, eventually, the tide. First however the group crossed the Pinkegat and, with rising water, skirted the south of Engelsmanplaat without difficulty. Then as the NE wind freshened, the tide began to fall. Risking stranding by remaining in the shallows of the Wierumerwad the little group tacked hard, crossing and recrossing each other’s tracks, ever eastwards. Those who elected to stay in the channels soon found their over ground speed fall away to nil against the rush of the ebb. Gradually however the Lauwersoog sluis came closer. With a final rush, powered by the fresh NNE breeze, the harbour mole came abeam and each boat ran downwind into quiet water, to raft up to await the lock. In the marina there was an invasion! Every corner held Drascombes. More arrived at the slip way every moment. 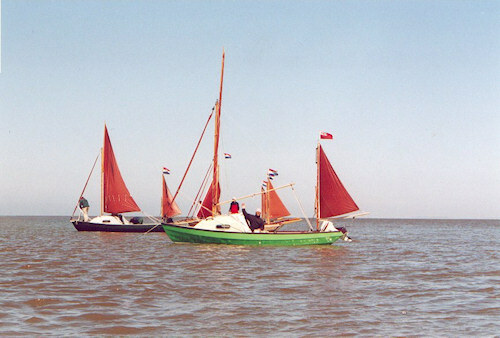 As the evening wore on it appeared that some eighteen boats had arrived, including ten Coasters, six Cruisers, a Longboat and a Scaffie from England, crewed by Richard Stroud: no stranger to the Waddenzee for he had participated as crew for Jim Hopwood, on Hippo, in the 2000 event. Coaster Butterfly with Kurt and Regina Mross came all the way from the Jade Busen harbour of Varel to promote the Dulcibella Cruise and the Varel Regatta, exploring the German Wadden flats this summer. With settled forecast – high pressure and light northerly winds – the Hemelvaart Wadden Cruise held great promise. At a brief 10:00 a.m. skippers meeting the proposal to go east towards Simonszand, with the flood, was accepted. By now it was rush hour! Yachts of all types and sizes jostled for space in the great sea lock along with commercial ferries and speedboats. It seems miraculous to report that all Drascombes emerged unscathed within ninety minutes, to make sail out onto the Wad. Soon the sea was dotted with small red sails, white hulls, blue hulls, black, brown, green, all powering east, close on the wind into the Groningerbalg and the channel that led away north east to Simonszand. Clusters of boats shared close sailing, others adopted a more relaxed pace. Chris van den Broek on Olle, as rear Admiral, came behind the fleet to assist with any problems. Michel Maartens solo in Yraida as the Admiral showed the lead. Fine on the wind the leaders soon crossed the shallows of the Brakzand, and now with the ebb under them shot away northwards tacking into the Eilanderbalg and the channels towards Simonszand. So the fleet spread out. In the Schildersron anchors were lowered, and it was time for a late lunch. Later most of the fleet assembled at this point. Yraida, Whisper of Sunart, Navis Longboat and Cruiser Midi, soon joined by Rietgans, raced on down the ebb, out between the drying sand flats to fall dry on the Simonszand. Sadly Navis went aground some 500 metres away on the wrong side of the channel. But, with an onlooking audience of grey seals, those who got there should confess that the feast of cockles with white wine, served up on Midi by chef Eugène, were superb! Later with the incoming tide the place became a maelstrom of crashing water. One by one the intrepid gourmets turned, hoisted a scrap of sail, and charged back up the channel. As the sun sank lower fifteen boats had assembled along the Schildersron. 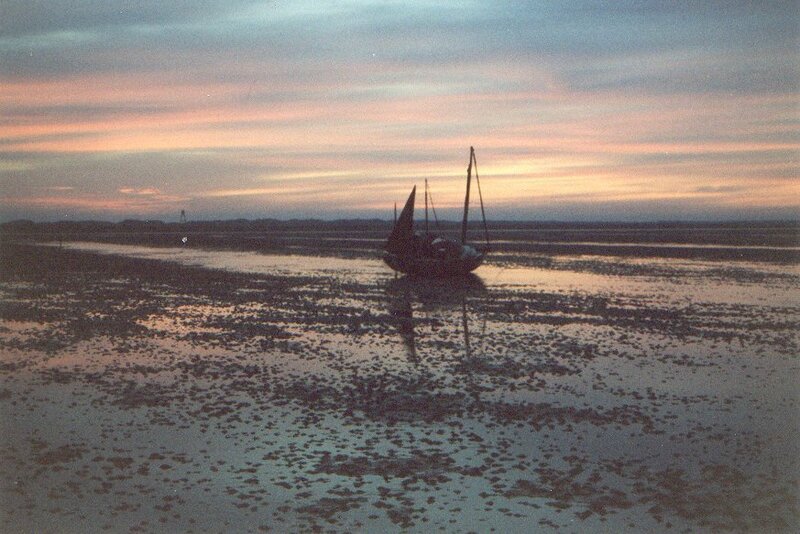 Then when the Admiral was satisfied that all was well with his ‘command’… (three boats had fallen dry on the Lutjewad), the anchors came aboard and the Drascombes ghosted west in the dusk, to fall dry on the ebb in the lee of east Schiermonnikoog. Friday dawned calm and bright. Crews soon emerged to wander the mud flats as late risers prepared their breakfasts. With returning water thoughts returned also to sailing. Today’s destination was Ameland. Malmok and the Scaffie Tubby-Too with Richard Stroud had remained overnight in the Schildersron, but soon came skimming over the shallows on the flood to join the fleet. One by one the Drascombes slipped away towards the SW. In the distance, working their way up from the south, came the small flotilla with Olle, Skua and Sequana who had stuck on the Lutjewad overnight. Passing the small Schiermonnikoog harbour the whole Drascombe fleet came together: the largest Hemelvaart fleet seen on the Waddenzee in this 20th anniversary year. But promptly it seemed to split again, as some skippers elected to go north of the Engelsmanplaat, while others opted for the Moker channel onto the Wierumerwad to the south. By mid afternoon the northern flotilla had dried out on the sands of De Hon (the east tip of Ameland). Way to the south the masts of the southern group could be seen poking out of the SE corner of the Holwerderbalg vaargeul, into which they had ‘descended’ on the ebb tide. Later with the incoming tide one by one these boats charged north to De Hon, and most crews wandered up onto the high dunes that look out to the crashing surf at the margins of the North Sea. Spontaneous little parties began as crews paid each other visits (that word ‘borreltje’ springs to mind!). Then eventually at dusk, with sufficient water at last, the flotillas ghosted along the southern fringes of the conservation area to Het Oerd. Having fallen dry at 02:00 a.m. it would be a long morning before the water returned. As dusk fell the Admiral came wading bravely through the deep mud of the shallows that split the two flotillas to exchange greetings. In the end the gently returning water encouraged crews back through the shallows to their own craft. What an evening! It is wondrous what can be transported in the ‘cellar’ of a determined Drascombe sailor. And so for this reporter the 2001 Hemelvaart Waddenzee Cruise came to an end. In the early hours of Sunday morning, one by one, Drascombes peeled off from the flotillas and, hastened by the flood tide, stormed SE along the Zoutkamperlaag, back to the sea lock at Lauwersoog, the slip way in the marina, trailers and home. The first rain of the week fell as the boat was packed away, conveniently rinsing the salt spray from the decks. Later back home, this ‘nut-brown’ sailor was suspected of having visited sunnier climes! But no… that actually was the Dutch Hemelvaart story in 2001.